Thank you for your support in 2017 ! It is time to reflect the year of 2017. This year I renewed the website design, created the logo for the business after 17 years, launched Weaving Bonds brand which is a collaboration work with a refugee weaver from Burma, conducted the 7th Japan tour and had a Studio Exhibition “Loom in Essence 2017”. I am amazed with all the accomplishment! It must be all your wonderful support for me and the studio. I am so grateful for that. These things could not be done without your kind words, enthusiasms ,encouragements and all kind of help. Thank you very much for being with me! Because of this business I never have felt lonely or bored when I had to face to living in an empty nest this fall. Actually there are a lot of wonderful energy coming into me now. I am so happy that I will be able to continue working hard to create a good environment for you to have an exciting journey with SAORI at the studio in 2018. I wish you all a very happy holidays and Happy New Year! Follow me on Instagram (SAORI Worcester). You can see everyday life of the studio. 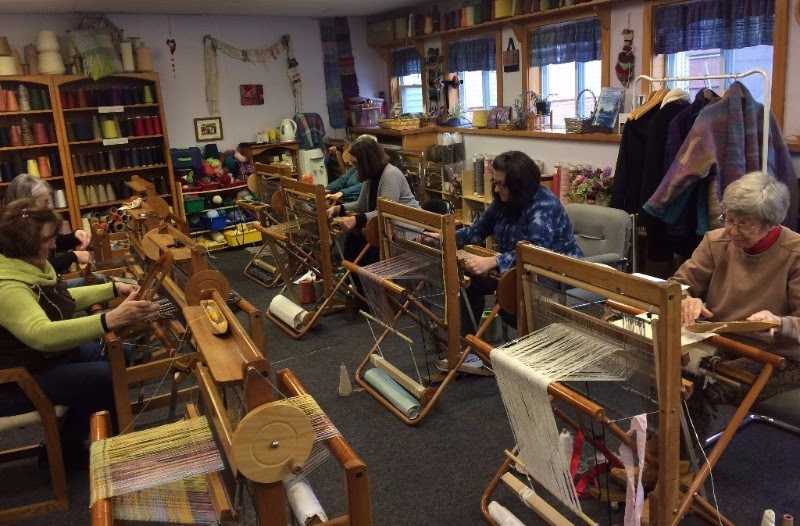 Sign up a trial class on my website now if you have not woven recently. It seems the year of 2018 is approaching fast although the winter has not arrived yet. I hope you had a great Thanksgiving. For myself I had a personal retreat at home which was what I needed to have. I have meditated, practiced playing the piano, woven. read and listened to music. I’d like to share some of my random thoughts which came to clear to me during the retreat. – I want to install a real bathroom in the studio building! It is very important for me to create a safe, welcoming and comfortable studio space for everyone. – I need create more work I want to make, instead of what people might like. – I am so grateful for wonderful people who come to take my classes. They are my family, friends and teachers. – I want more people to discover SAORI in the world! 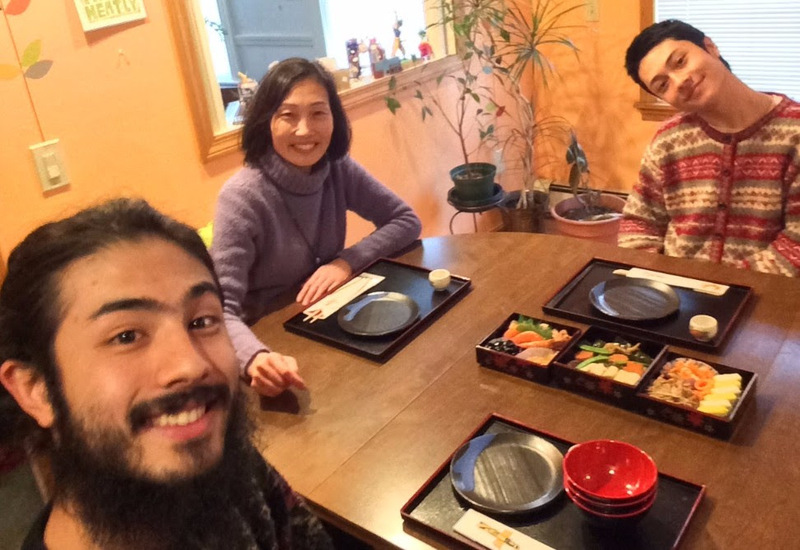 – SAORI is a great tool to communicate inclusion, peace, community, and self-awareness. – Life is too short to wait starting something good. One thing I decided to do from the thoughts is hosting a Japanese traditional New Year celebration for the current students. New Year is the most important holiday in Japan. Traditionally all stores and businesses are closed for three days and school won’t start until Jan. 8th. When I was a child, my parents made a plan when they cook what and when they clean what. And the whole family worked to cooked and cleaned the whole house in the last week of December in order to purify the house to welcome a new year with good luck. The first meal on the New Year Day is a special feast with new chopsticks. I have been keeping cooking specific food for the day to pass the tradition to my children. In 2018 I would like to share this tradition with my extended family. Sorry I cannot invite every one of you this time. This is limited to the current students. It is my expression of the gratitude for your constant support. It will be Jan. 7th (Sun) Noon. BYOB (Bring your own Beverage, such as beer, sake, wine or soda) Please RSVP by the end of Dec. Don’t forget to let me know your dietary restriction if you have any. If you are not current students but would like to come to the meal, please sign up a course right now! (lol) If you pay the deposit to save your space for Basic Course, Advanced Basic Course or Membership starting January, I will invite you. If you would like to help cooking or setting up, let me know. I hope many of you can make it. 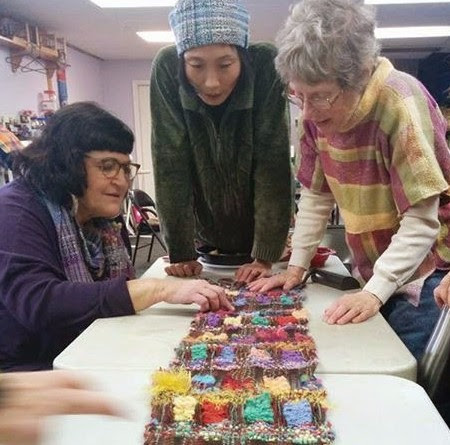 This is a special workshop for people to weave for longer time so they can make a scarf size piece to take home. You can make a gift or treat yourself. Or give this experience as a gift to someone who like hands-on activity. Sign up with your friends or families to have fun together! If you bring your own yarn to weave, you don’t need to pay for the materials. Please feel free to bring your snack and beverage. No experience necessary. All ages are welcome. Regular trial classes are available in the regular class time as far as the class is not full. You can sign up on website. Since I have some requests I plan to have a study group in 2018. It is 2015 when we had it last time. It is about a time to have a new one. This is a six month program that people work on a same assignments each month and study together in a monthly meeting. The assignment will be determined by the group members. Last time we had challenges such as weaving with one color, weft-faced weaving, loose weaving and so on. This is for people who want to develop their creativity further without specific projects in mind AND who can commit to work seriously for six months and attend most meetings. It would be a great opportunity to make you be in the zone and gain a-ha moments. You will develop your sensibility (Kansei as Misao Jo mentioned) As a result you will obtain knowledge and skills. I guarantee that this will accelerate your understanding SAORI philosophy. Of course I will be one of the members. If you want to join the group, please let me know ASAP. On January 27th at 10am-2pm at Russell’s Garden Center the Fiber Day of Wayland Winter Farmers Market will be held and I will be there. It is very nice to be in the green house in the middle of winter. Please stop by. There will be wonderful organic vegetables, and other fiber vendors as well.